Three pieces in Archie Brennan’s Mohammud Ali series are on display at the Scottish National Gallery of Modern Art. The exhibition is titled “20th Century: Masterpieces of Scottish and European Art,” currently on view and lasting through September 27. This display of works from the collection of the Scottish National Gallery of Modern Art offers an historical overview of some of the most remarkable art made during the last century. It concentrates on areas in which the Gallery’s collection is particularly strong. Since it has always been central to the Gallery’s mission to place modern Scottish art in an international context, we have tried to show the best of Scottish art alongside modern European masters. Archie has three works of ink and pencil on paper from his Mohammud Ali series in this exhibition, which are in the museum’s collection. His work is hanging near the collection of MC Escher works and is in good company with works by Picasso, Edouard Vuillard, and Scottish artists William Turnbull and Margaret MacDonald Mackintosh. Are you tempted to drop everything and make a trip to Edinburgh? Yeah, me too…. 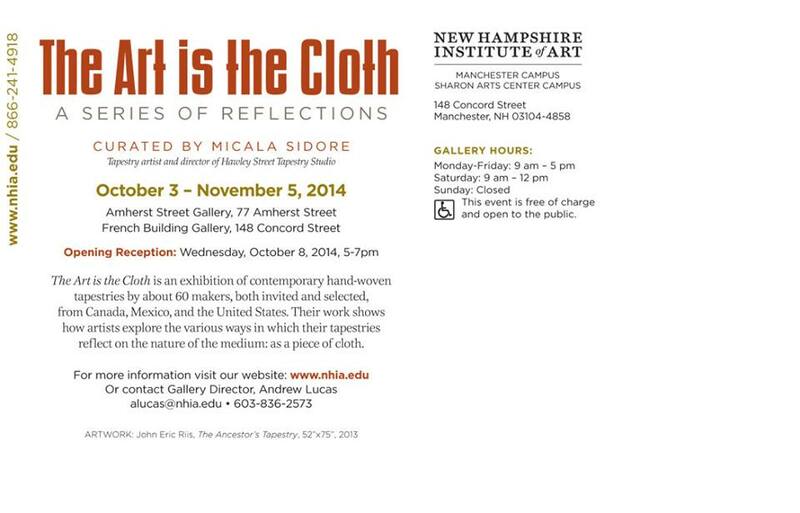 Carol Russell curated this show, inviting 40 tapestry artists from 9 countries to participate. She worked with Schiffer Books to create a beautiful catalogue for the show, published as a hardback book. While I’ve been away this winter my mail has been forwarded to my son’s house, and that book is waiting for me there. It’s a five-hour drive to his house, but it will be at the top of my to-do list when I return home. I can’t wait to see this book! And, of course, the show itself. I’ll be headed there in early May, right before it closes on May 10th. If you haven’t seen it, there is still time! If you cannot get there at least you can order this beautiful catalog. Over 300 people attended the opening reception of “Contemporary International Tapestry” at Hunterdon Art Museum in Clinton, NJ. 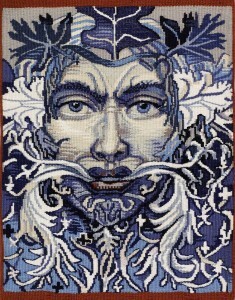 This exhibition which is curated by Carol Russell, has works by 40 tapestry artists from numerous countries. More events will take place during the span of this exhibition, including a presentation by Archie Brennan and Susan Martin Maffei, called “A Day of Contemporary Tapestry” which will include a lecture and an interactive demonstration by Archie, on Sunday, March 22, from 9.30 am – 4.30 pm. This exhibition will be on view until May 10. January 11th at the Hunterdon Art Museum! Don’t Miss it! Sunday, January 11, Archie Brennan and Susan Martin Maffei will be at the opening reception of “Contemporary International Tapestry” at Hunterdon Art Museum in Clinton, NJ. This exhibition is curated by Carol Russell and has an impressive collection of works by prominent tapestry artists! Other artists that will be in this exhibition include: Jo Barker, Joan Baxter, Helga Berry, Rebecca Bluestone, Elizabeth J. Buckley, Soyoo Hyunjoo Park Caltabiano, Włodzimierz Cygan, Alla Davydova, Annelise De Coursin, Susan Edmunds, Alex Friedman, Ina Golub, Barbara Heller, Susan Hart Henegar, Silvia Heyden, Dirk Holger, Peter Horn, Constance Hunt, Susan Iverson, Ruth Jones, Aino Kajaniemi, Jane Kidd, Lialia Kuchma, Christine Laffer, Ewa Latkowska-Żychska, Bojana H. Leznicki, Lore Lindenfeld, Yael Lurie and Jean Pierre Larochette, Susan Martin Maffei, Julia Mitchell, Janet Moore, Jon Eric Riis, Ramona Sakiestewa, Micala Sidore, Elinor Steele, Sarah Swett and Linda Wallace. To top off this spectacular collection of work will be a comprehensive hardbound catalog of this exhibition! There are several exciting tapestry events going on right now on the East Coast, and Archie is involved in a number of them. “The Art is the Cloth” exhibition is currently at its second venue in Pennsylvania and will move to Deerfield, Massachusetts after the new year. 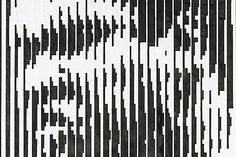 Carol Russell is curating a an exhibition of contemporary tapestries from all over the world that will open at the Hunterdon Art Museum in Clinton, New Jersey, on January 11. This exhibit will be on display until May 10, 2015. Sunday, March 22, 9am – 4.30pm: Archie Brennan and Susan Martin Maffei will give lectures and demonstration with a reception to follow. 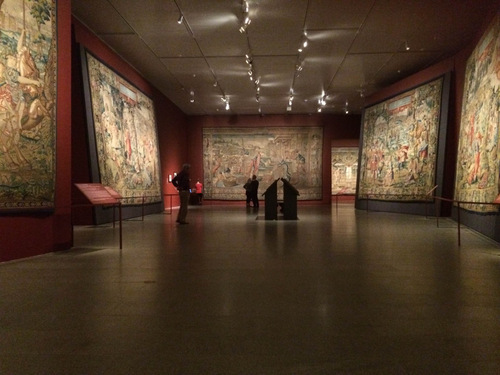 The big tapestry exhibition at the Metropolitan Museum of Art that features the works of Pietr Coecke van Aelst will be closing on January 11, 2015. There will be a symposium on this exhibit on January 10 and 11. 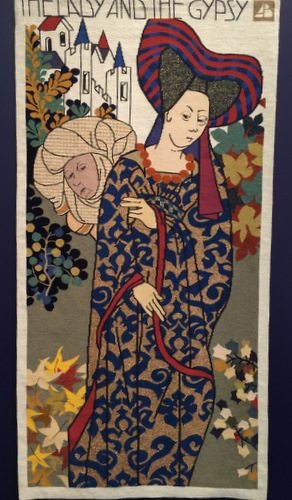 What a terrific opportunity to view stunning historic tapestries from the Flemish tradition of the 16th century, followed by a superb line up of exciting contemporary tapestry in New Jersey! Plenty of opportunity for people on the East Coast to see Archie’s work in the next few months! Enjoy! 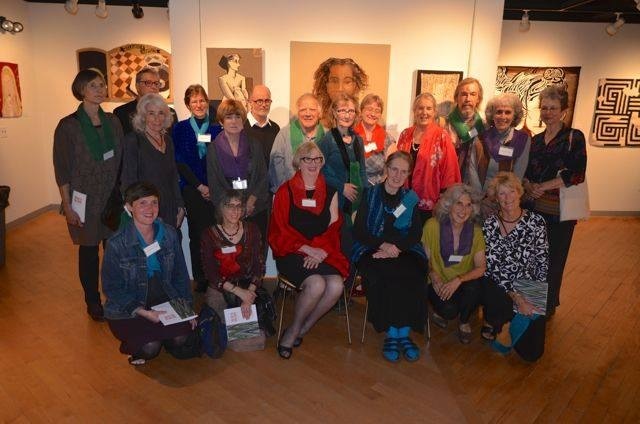 Both Archie and Susan Martin Maffei attended the opening, along with many other artists with work in this exhibit. One of our own Wednesday Group members, Anna Byrd Mays, has a piece in this show, along with a number of TWiNE members. This show will travel to two other venues on the East Coast. On October 1st, all the members of the Wednesday Group gathered at our site on the Hudson for our last regular meeting. We will never disband (famous last words! ), but we will no longer meet on a monthly basis. As the saying goes, “there is nothing more constant than change,” and we have all made peace in our own way that the Wednesday Group must endure some growing pains. We made plans for smaller groups to meet on an adhoc basis, and for the entire group to convene once or twice a year going forward. I don’t normally write about my personal experiences with Archie, or the Wednesday Group, but on this occasion I feel very moved to do so. I hope you will indulge me! Over the past several months we have all been working on an idea that Archie concocted. For the past couple of years we have been staying for a communal Chinese take-out dinner after class on Wednesdays. Archie wanted to recycle the growing number of used chopsticks left over from these dinners, so he made each us of a loom with 15 chopstick warps. He charged us with the assignment to weave a face. 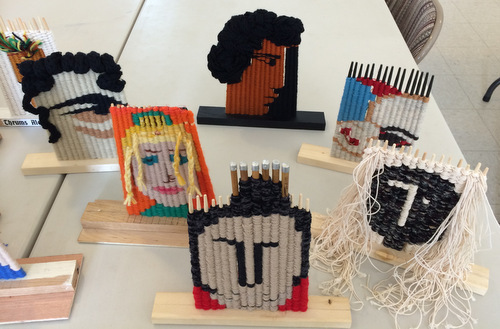 At our last meeting almost everyone had delivered their chopstick portraits. Some of us really enjoyed the challenge and made some chopstick warps of our own so we could do more than one. We were all surprised to see that it was easy to identify who wove each one of these characters! We have all developed a pretty clear individual style! Can you guess which two are Archie’s? There is a wonderful sextet of maneki neko not included here. So, stayed tuned….maybe one day they will have a public appearance! Archie planned a lovely farewell to us, although most of the group may still be wondering what that message was! On the last day of class he brought in a completed tapestry that all of us had seen at different points during its making. It’s a poem that Archie decided to weave ‘in code.’ It is one of his many explorations of language and meaning. He is fascinated with how easily humans can read many different font styles in printing and many different handwriting styles. 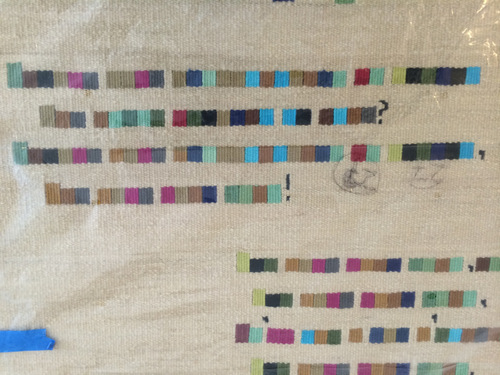 He wondered how well anyone could ‘translate’ letters into colors and read his woven message. He brought the tapestry for us to see and for us to decipher. This challenge brought out the puzzle solver in me, but I did not decipher it before the end of class time. As Archie wrapped up the tapestry I took a photo of part of it in its plastic covering. Very shortly after class, four of us were sitting together at a lovely spot on the Hudson River, puzzling over the code that would unlock this woven poem. Two of us came up with a possible answer and then all of us began testing the idea. We were right! I’d love to tell you what the poem is, but Archie wants everyone to have the challenge/pleasure/torture of figuring it out for himself. We were going to meet Archie and Susan for dinner in a matter of moments, and one of us had the brilliant idea of singing our own farewell to Archie at dinner. When we got to the restaurant the four of us surrounded him and sang our own farewell song to him. Not only was it obvious that he knew we had broken the code, he also seemed very touched that we had thought to do it! Yes, it was a bit embarrassing in a busy restaurant on a Thursday evening. Yes, it was corny! The upside was Archie’s wonderful reaction and the applause we got from the other diners! It’s never easy to say goodbye, and for some of the Wednesday Group, it is a goodbye after more than 20 years. For the four us who had the good fortune to have this last dinner with him, and to wish him our own personal goodbye, well…..it just could not have been any sweeter! You KNOW you want it…. so let me just give you a little tease that will have you putting this set at the top of your wish list! 16 hours of brilliant instruction by Archie Brennan and Susan Martin Maffei, filmed by Garry Benson of Dragon Design in South Australia. This set took years to produce….and you’ll see why when you get it! DVD 6: Hatching and half-pass, etc. 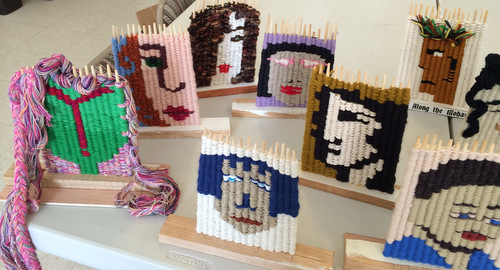 The Fuller Craft Museum is currently holding an exhibition of fiber arts that include some very well known artists. Archie Brennan, Susan Martin Maffei, Maximo Laura, Lia Cook, Dianne Itter, Michael Rohde are just a few of a long list of names we all recognize. The opening was August 3, and will continue until November 23, so there is still plenty of time to get there.